Giuseppe Maria de Peppo, PhD, a NYSCF Postdoctoral Fellow, recently co-authored a book chapter in the seventh volume of Stem Cells and Cancer Stem Cells assessing the utility of certain stem cell types for bone engineering and bone replacement therapy. Current research has demonstrated the high potential for human embryonic stem cells to become bone progenitor cells; however, these cells cannot be therapeutically implemented as they often form tumors in vivo. 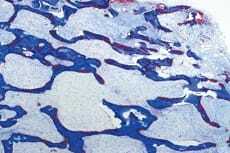 Other stem cell types and, of note, mesodermal progenitors have showed promise for bone replacement therapy. In the chapter, Dr. de Peppo outlines the potential avenues for further bone engineering research.